This Sectoral Plan contains proposals for offshore wind energy development in Scottish Territorial Waters up to 2020 and beyond. 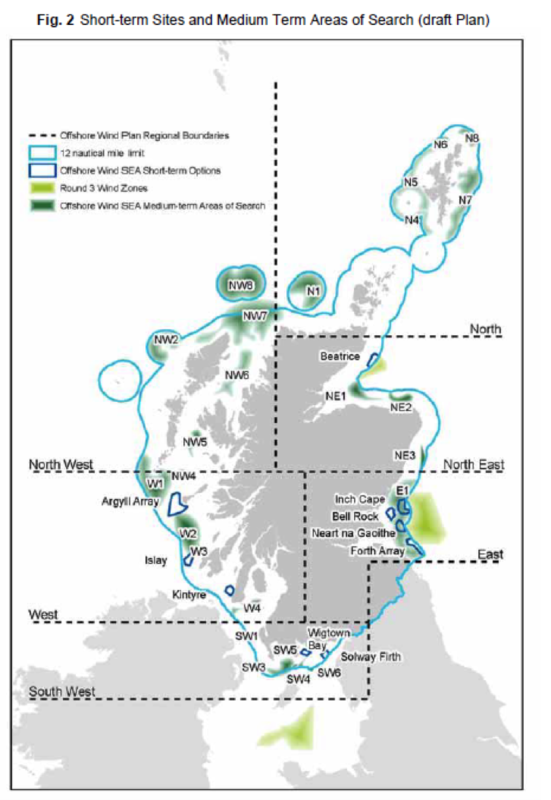 What areas are being developed for offshore wind in Scotland, now and in the future? What are the potential consequences (environmental and social) of these developments? What are the strategic issues to be considered in developing offshore wind in Scotland? How does sectoral marine planning relate to marine spatial planning? This is the strategic planning document for the development of offshore wind energy in Scottish Territorial Waters. It contains proposals for development at the regional level up to 2020, 2030 and into the longer term. This Sectoral Plan builds on the Strategic Environmental Assessment (SEA) required under the SEA Directive, for the assessment of potential effects of the development of a draft Plan for offshore wind in Scotland, enabling a final plan to be produced; “Blue Seas - Green Energy: A Sectoral Marine Plan for Offshore Wind Energy in Scottish Territorial Waters”. 10 short-term options were identified based on sites developed by the Crown Estate and offered (through Exclusivity Agreements) to offshore wind developers. A further 25 medium term ‘areas of search’ were identified, and which will be subject to further assessment. Scottish Ministers have adopted the Plan. A Post-Adoption Statement (PAS) has been produced which details how the assessment outputs and the consultation analysis have been taken into account in the final Plan. The Sectoral Marine Plan for Offshore Wind in Scottish Territorial Waters will be integrated into and inform the emerging marine planning framework in Scotland. The requirement to develop the Plan is not a statutory provision of related marine legislation and is intended to complement both the National and Regional Marine Plans through the provision of relevant information and assessment or specific areas of marine planning. It will also be complemented by Regional Locational Guidance which will provide more prescriptive information for developments in relation to the potential for development in marine areas of resource acknowledging environmental and sectoral constraints. The Scottish Government has used a marine planning approach to develop Blue Seas Green Energy – A Sectoral Marine Plan for Offshore Wind in Scottish Territorial Waters (the Plan). This process was started through the application of Strategic Environmental Assessment (SEA) to produce a draft Plan. The SEA Environmental Report and draft Plan were consulted upon before Habitats Regulations Appraisal (HRA) and Socio-economic Assessment were applied to inform the contents of the final Plan. The Scottish Government consulted with statutory, sectoral, regional, voluntary and other bodies as well as individuals on the planning process. The Plan is based on current knowledge and views but will be subject to monitoring, research and consultation to enable an informed Plan review. The Scottish Government will continue to adopt marine planning approaches in future sectoral development through the use of scoping tools such as the Marine Resource System (MaRS), and the application of marine planning techniques such as Regional Locational Guidance (RLG). The Plan sets out recommendations and issues to be considered on a regional basis; East Region (off the Forth and Tay); North East (Moray Firth), North, North West, West Coast (Tiree, Islay and Kintyre) and the South West (Solway and Wigtown Bay). This report documents the strategic planning for offshore wind in Scotland; it may be of material relevance to countries who share a border with Scottish waters and may be of methodological interest to other countries developing sectoral marine plans alongside marine spatial planning processes.